We help journalists gather reliable scientific information and identify experts. We help make climate change science available and comprehensible to the media and to the public. Our work includes preparing accessible materials, organizing workshops, and offering one-on-one assistance to provide journalists with the most credible science. Starting in 2018 Climate Communication is leading the development of workshops for journalists as part of the National Science Foundation funded project Climate Matters in the Newsroom – which helps journalists on every beat to tell timely, science-based, local climate change stories. The program expands upon a project called Climate Matters, which provides localized materials to more than 675 weathercasters nationwide, but now broadens these trainings and materials to cover a wider range of climate change impacts and solutions, helping a wider array of media professionals with diverse reporting responsibilities. Since the 2018 launch of Climate Matters in the Newsroom almost 200 journalists have signed up to receive climate reporting materials and over 150 have attended in person trainings. Climate Matters in the Newsroom workshops assist journalists in reporting on climate change impacts that go well beyond increasingly extreme weather. Our trainings help journalists reporting on business, agriculture, health, energy, and more to tell local stories that involve climate change impacts and solutions. View a list of 2018 Climate Matters in the Newsroom trainings. 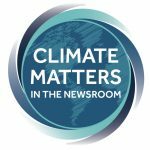 Climate Matters in the Newsroom is a collaborative effort among a diverse range of partners, each contributing to various parts of the project while taking the lead in their areas of expertise. Climate Communication is leading the development of workshops and other training opportunities for journalists. The Center for Climate Change Communication (4C) at George Mason University is conducting research on journalists’ opinions on and experiences with climate reporting. Learn more about the research the Center is doing on climate reporting. Climate Central is producing weekly materials, customized to every media market in the country, to support local climate reporting. Learn more about Climate Matters, view the media archive, and sign up for the weekly materials. NASA and NOAA provide scientific advice and input for all aspects of the CMN project. The Society of Environmental Journalists, National Association of Black Journalists, National Association of Hispanic Journalists, Radio Television Digital News Association, and the Carole Kneeland Project are participating in the survey research and ongoing professional development opportunities for their members. In collaboration with SciLine, Climate Central, and George Mason’s 4C we are producing one-page fact sheets to help reporters covering extreme events like wildfires to explain the connections with climate change. In Fall 2015, in collaboration with the North Carolina Coastal Federation, the Southeast Climate Science Center, and Climate Central, Climate Communication organized and led a workshop in Beaufort, NC. The workshops, which featured talks by Director Susan Hassol, climate scientists Michael Mann and Tom Peterson, popular broadcast meteorologist Greg Fishel, as well as local researchers, were designed to provide a forum for media professionals to learn about climate change and its impacts in coastal North Carolina. Below, Susan introduces the workshop. A full series of videos showing portions of the workshop can be found here. Susan’s concluding thoughts on the workshop are below. If you are a journalist seeking information on climate change, please contact us.